Kawasaki’s ‘supercharged sensation’ to attract speed lovers! 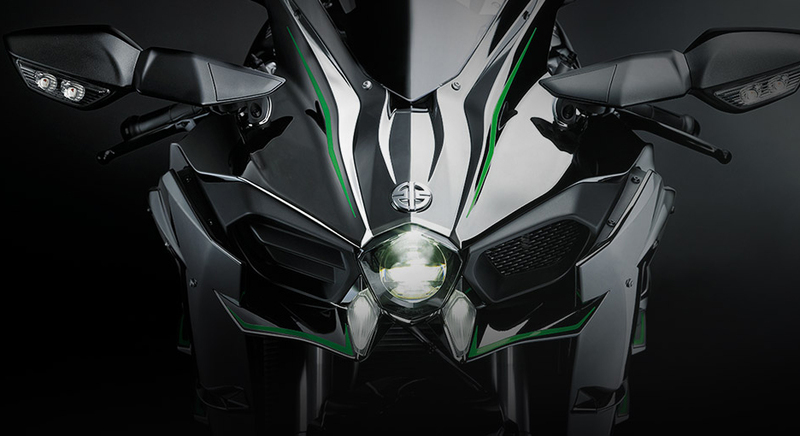 Meet the Kawasaki Ninja H2: Catch it if you can…!! To quench the ‘speed thirst’ of some of the craziest individuals, Kawasaki Heavy Industries recently presented the H2 version of its very popular Ninja series. Ninja H2 is a product where innovation meets high-quality engineering and the result is just in front of us! Let us see what turns these products into the engineering marvels they are! Applying the knowledge it gained from the aeronautical experience, Kawasaki has begotten the most distinguishing 998cc., 4-cylinder, inline, supercharged, DOHC engine which powers Ninja H2. So, this bike has become the first street-legal sports bike in the world that employs a supercharger (centrifugal type). Supercharger runs on the power developed by the engine and its function is to pump the compressed air into the engine during the intake stroke thereby improving the power output. The impeller of the supercharger fitted on Ninja H2 rotates with speed 9.2 times the speed of the crankshaft. Thus, it achieves a monstrous speed of around 1,32,000 rpm. The pumping capacity at this point reaches upto 200 liters per second. It’s not just the supercharger that reflects its inheritance from aeronautics. However, there are so many other components which help. Kawasaki tuned the Ninja H2's planetary gear mechanism and specially manufactured pistons to the perfection for the ‘aero born’ experience. 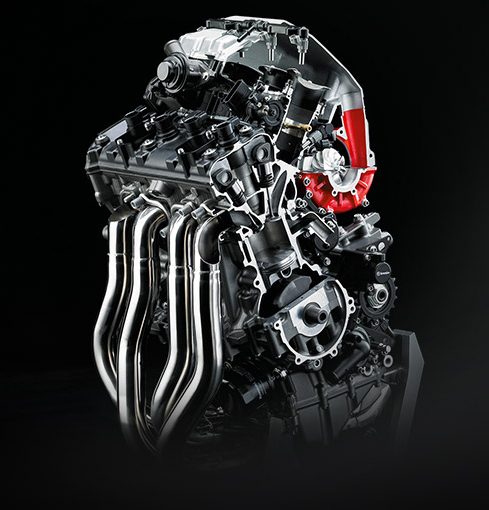 The engine of Ninja H2 churns out 200 hp (nearly 150 kW) of raw power whereas the one fitted on its elder sibling i.e. H2R (only track legal version) produces 300 hp (nearly 250 kW) of power. To transfer this huge chunk of power seamlessly to wheels, the engine of Ninja H2 gets a six-speed dog-ring gearbox. A hydraulic clutch aide the actuation which enables smooth shifting. The arduous task of bringing down the high speed of Ninja H2 is performed very well by two 330 mm discs at the front while the rear end is managed by a 250mm disc. ABS and Traction Control systems are also available on this bike. In terms of suspension, this bike features 43mm inverted telescopic fork at the front while the rear part is supported by single-sided swingarm with mono-shock. Furthermore, along with a powerful and lightweight engine, the Ninja H2 has an aerodynamic body shape. It plays a very important role in achieving the desired degree of performance. The finned cowl and the other linings throughout the body make the air move across swiftly. Thus, the rider literally rides the wind! The external body shape also projects a muscular and futuristic look. 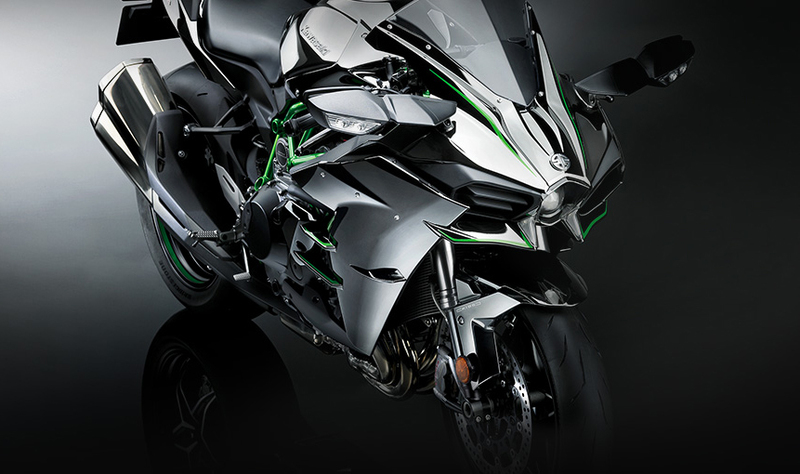 So, this makes the Kawasaki Ninja H2 an apple of the eye of many!